Working within the invoice finance arena we are always very aware of the potential for fraud. The large amounts of money that a fraudster can potentially extract from finance companies make them attractive targets. However, the measures taken by lenders, to detect and protect against fraud are highly developed. This is not necessarily true of UK businesses generally, who can also fall victim to invoice fraud, if they don't take measures to protect themselves. Invoice fraud is where a fraudster will try to trick businesses into paying an invoice. The invoice may be fictitious, or they may use a legitimate invoice but ask that payment is sent to their bank account. We receive a steady stream of fraudulent invoices by email, although we have also had them by post. Often they will be headed with an invoice number and requesting that we make payment. At a glance they often appear legitimate, may bear details such as order numbers etc. as many companies use that format to send their legitimate invoices. However, there are often tell tale signs (see below) that can help you spot these frauds. The attachments, purporting to be copy invoices or statements, can also contain viruses. New research from UK Finance (covered in Mondovisione) suggest that invoice fraud may be affecting a vast number of UK businesses. Their "Fraud The Facts 2018" research suggests that in 2018 alone such scams cost UK businesses c. £93M, with the average loss being c. £28K. 9% of micro businesses (1 - 9 employees). 12% of small businesses (10 - 49 employees). 17% of medium businesses (50 - 249 employees). 26% of large businesses (250+ employees). You will note the increasing incidence as the size of the organisation grows. Further research by UK Finance suggests that some 43% of UK businesses may be unaware of invoice fraud. 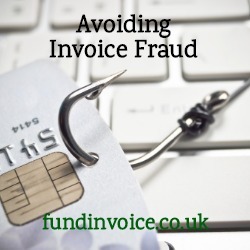 Below are some simple steps that explain how to help avoid falling victim to invoice fraud. Contact your bank straight away if you think you have been a victim of invoice fraud. Be cautious if you receive an unexpected invoice, even if it appears to be from a legitimate supplier - call the supplier, using a known number, to confirm. Use anti-virus software to scan emails and email attachments before opening them. Confirm any change of bank details directly with the company (taking steps to use legitimate contact details)..
Use contact numbers that you have obtained from a legitimate source i.e. not from the invoice, or the email with the invoice. When paying new bank details for a supplier, send a small payment initially, and confirm it was received with a legitimate source, before sending larger amounts. Never reveal details via the phone to parties you don't know.